Enjoy your gyozas with a very healthy dipping sauce, thanks to our extra-virgin olive oils. For steamed dumplings we recommend adding a dash of our Sublime Blend EVOO to the soy sauce, as its aromas will highlight and even intensify the flavor of thefilling. 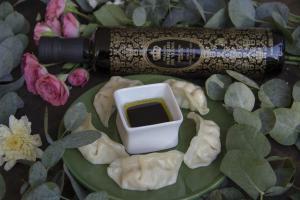 If you prefer to fry your dumplings, add a dash of our Palacio Blend EVOO to the soy sauce for a perfect combination. Try it and let us know which you prefer!